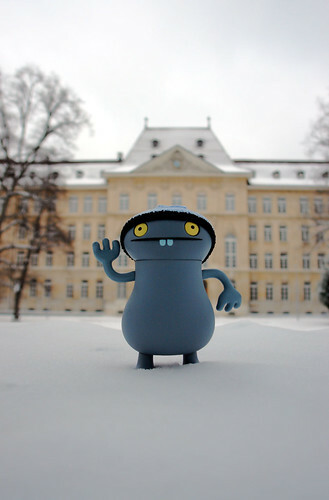 Uglyworld #284 - Babo at the Elisabethan House in Basel (10/365), originally uploaded by www.bazpics.com. After having his picture taken earlier at the side of the River Rhein Babo wasn't too concerned about getting more pics taken of himself (he said he was more interested in testing out his new hat against the cold weather). Anyway - Babo said it looked great and would make a great background for another pic of him in his new hat, and then when he noticed there was a bandstand which was covered in untouched snow he was off at sprinting pace in it's direction and when I finally caught up he seemed to still be a little out of breath. Hope you enjoy his portrait pic as much as he does (he's been showing it off to the other Uglydolls since we got back).